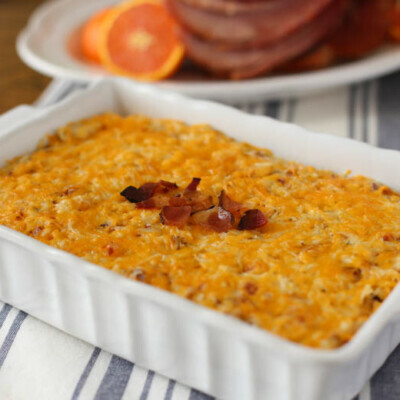 This creamy, comforting Hash Brown Casserole is made from scratch, requires no canned cream soup, and is gluten-free. Perfect side for a holiday table! *All of Burgers’ bacon is gluten-free, but you’ll see it clearly labeled on the Burgers’ Uncured Country Bacon. Preheat the oven to 350°F. Grease an 9×13 casserole dish with butter or cooking spray. In a glass measuring cup, whisk together the chicken broth, half and half, cornstarch, parsley, poultry seasoning, salt, and pepper. Set aside. Heat 1 tablespoon butter in a medium saucepan over medium-high heat. When the butter is melted, add the onions and saute until translucent, about 3 minutes. Stir in the garlic at the end for about 30 seconds, until fragrant. Whisk in the creamy cornstarch mixture to the onions. Bring to a simmer, stirring constantly until thick and creamy, about 2-3 minutes. Remove from the heat, stir in the remaining 4 tablespoons butter, and let cool. Bake for about 45 minutes, until edges are bubbly and top is golden.